KBR defends its performance, says safety and security is its "top priority"
WASHINGTON (CNN) -- Two Democratic senators called on the Pentagon to take back more than $83 million in bonuses paid to military contractor KBR after a Defense Department report criticized its electrical work on U.S. bases overseas. Staff Sgt. 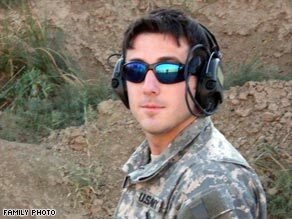 Ryan Maseth, a 24-year-old Green Beret, died in a shower at his base in Iraq in January 2008. "I want them to tell us on what basis can they possibly continue to justify having paid $83 million of the taxpayers' money for shoddy work that resulted in risk to our soldiers," Sen. Byron Dorgan of North Dakota told reporters Friday. Dorgan said he and Sen. Bob Casey of Pennsylvania are pressing Defense Department officials to reclaim $83.4 million in bonus payments it awarded KBR for its work in Iraq. Based on the findings of a report issued Monday by the Defense Department's inspector general on the electrocution deaths of U.S. troops in Iraq, Casey said the Pentagon should fine KBR and "make it hurt and make it count." "These are just absolutely stunning conclusions about failures by KBR as well as failures by our government," Casey said. The Houston,Texas-based military contractor defended its performance, saying Friday that Dorgan and Casey "are wrong in their assertion that we have been derelict in our duties to protect the troops." "The safety and security of all employees and those the company serves remains KBR's top priority," KBR spokeswoman Sarah Engdahl said in a statement. The Pentagon report concluded that the death of Staff Sgt. Ryan Maseth, a decorated Green Beret from Pennsylvania, stemmed from failures both by the U.S. military and by KBR. The company did not properly ground and inspect electrical equipment, the report found, while Maseth's commanders failed to ensure renovations to the building where he was quartered had been properly done and the Army did not set electrical standards for jobs or contractors. Maseth was electrocuted in a shower in his Baghdad quarters -- a former palace of deposed Iraqi leader Saddam Hussein -- in January 2008. KBR has said the palace was not properly grounded by contractors when it was built. The Pentagon report concluded that KBR failed to ground a water pump at the building, and the company did not report improperly grounded equipment during routine maintenance. Maseth's family is suing the company. Two lawsuits against KBR in the death of another soldier were dismissed earlier this week, and Engdahl said KBR "maintains that its investigation has produced no evidence linking KBR to Staff Sgt. Maseth's death." Dorgan said the inspector general's report found KBR's work throughout Iraq was of poor quality, with more than 53,000 sites in need of upgrades or repair as of March. "The question for us is, when will there be accountability -- accountability that requires contractors to measure up?" he said. "And how do we get that from both the Pentagon and contractors?" Maseth's mother, Cheryl Harris, said wiring problems are a problem for U.S. troops in Afghanistan as well. "I do know firsthand that our troops are continuing to be shocked -- even in showers in Afghanistan," said Harris, who joined the senators at a news conference Friday. "I still have contact with a lot of soldiers on the ground over there."